Ahh…February. The month of love! It’s also American Heart Month and Black History Month. Then there’s Groundhog Day, Super Bowl Sunday, and Galentine’s Day. Also, did you know that February 9 is National Pizza Day? 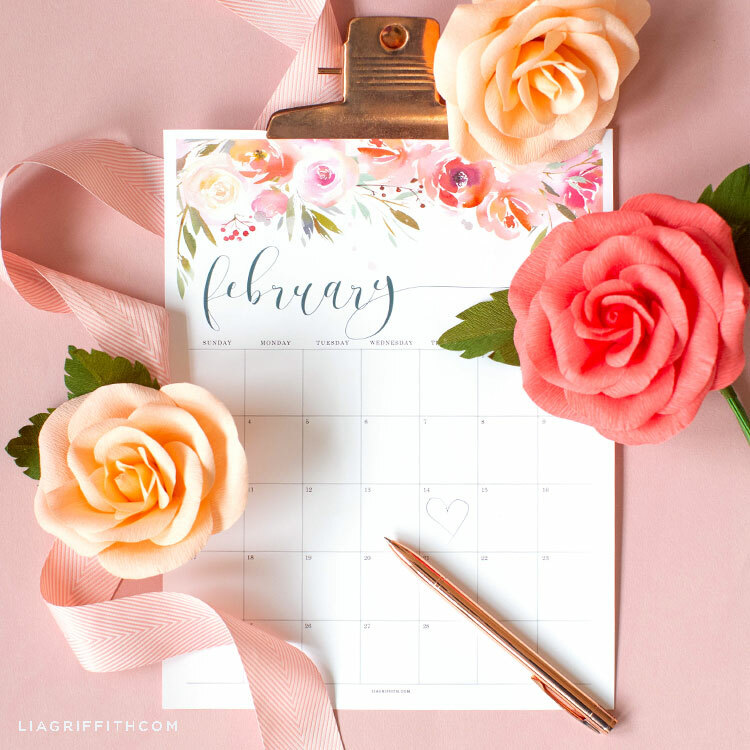 To help you keep track of it all, we created this (free) February 2019 printable calendar for you. If you’re a member, you can download the full 2019 calendar here. Otherwise, just scroll down to print your freebie. And make sure to also download the font Sagona Demo to edit your calendar (it’s free, too!). 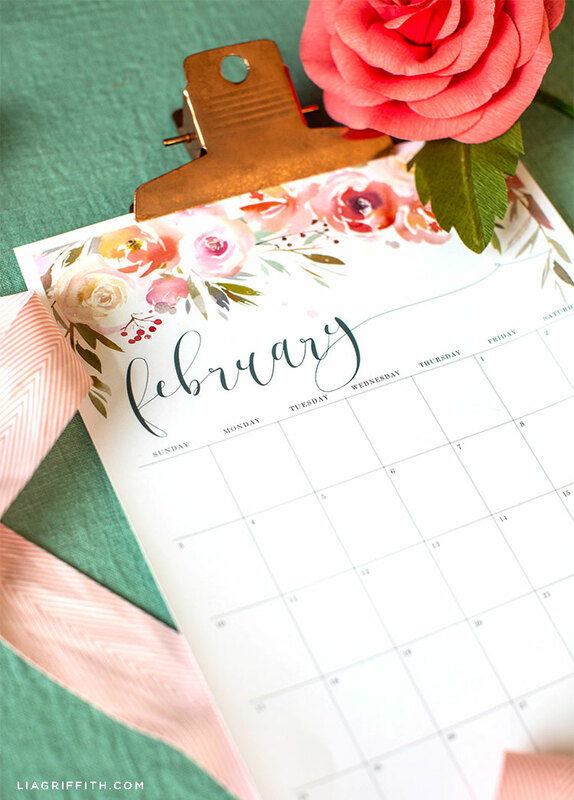 No matter which holidays you celebrate or what you have planned for the month, you can enter it in your February 2019 printable calendar. The only date we have marked in the calendar is Valentine’s Day. But if you don’t celebrate it, go ahead and delete it. It’s your calendar after all! You can also add holidays that you do celebrate. For example, maybe you want to add Chinese New Year on the fifth. Or maybe you want to remember other events that people around the world celebrate, like National Random Acts of Kindness Day. Whatever you have going on this month, we hope it’s a fabulous one for you! Download the PDF below, edit accordingly, and print! If you want to add your own holidays, plans, and events, make sure to download the free font Sagona Demo. Once you click the link, click the green button toward the top right of the page that says “buying options.” Next to the desktop icon, it will say “free.” Finally, click the blue “add” button. Of course, you can always write directly on the calendar, too! After editing your calendar, it’s time to print it. We like to print our calendars onto 8.5″x11″ white cardstock. But you can also print it onto regular copy paper if you want a more lightweight version. For more DIY ideas and inspiration, join us on Instagram, Facebook, YouTube, and Pinterest—and sign up for your own membership today. Want to be featured on our social media pages? Remember to use #MadeWithLia when sharing photos of your Lia Griffith projects. 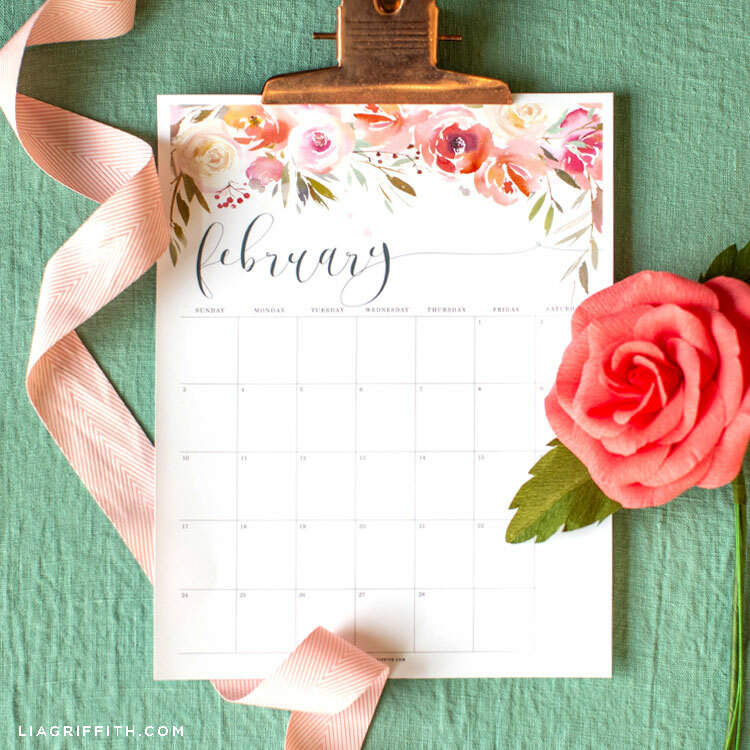 Your Feb Calendar collection is nice, can you please guide me how to save them in PDF file. Thank you! Just hit the download button at the bottom of the post to save the PDF. This calendar is perfect! We keep a big family calendar on the wall, but this on my desk to keep track of my blogging schedule would be so helpful! Thanks for the calendar! I love ideas to help me stay more organized. I Love my new calendar for February. Thank you so much!!! Both times I’ve tired to download this – there are no flowers at the top. Make sure you download it to your desktop, then open in Adobe. If you’re viewing it in a web browser, the flowers likely won’t show up.